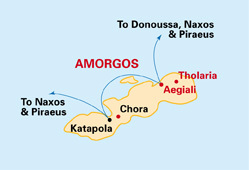 Amorgos is dramatically mountainous (with the famous monastery of Chosoviotissa hanging desperately on to one). 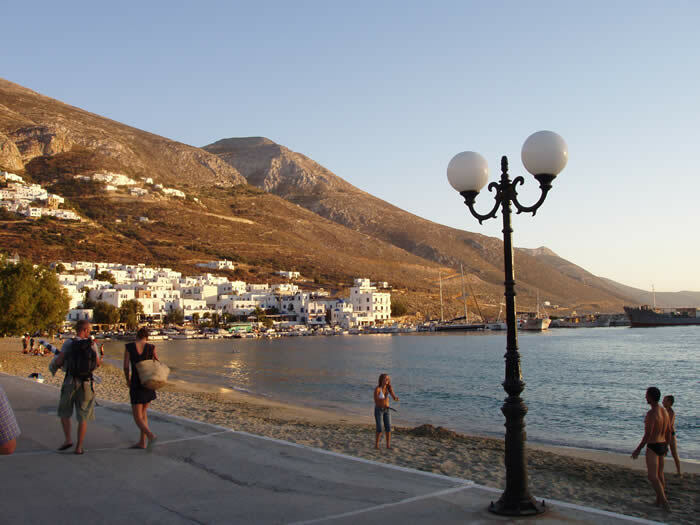 There are two ports, a gem of a chora, awonderful long sandy beach at Aegiali, splendid scenic walking, especially along the spine, and several idyllic villages. Aegiali is a small village at the northern end with a big jetty, a street of stepped terraces rising from the harbour to support a string of bars; and the beach. The bay is encircled by hills on which perch picturesque Tholaria and Langada linked by a scenic path. Tholaria is a collector’s item of a Greek village, where rural life is lived as it has been for centuries. 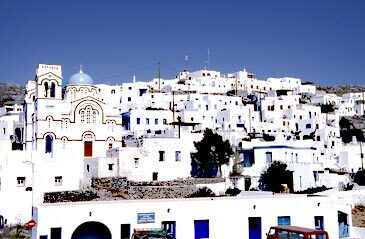 Half way along the island’s north coast is the main port, Katapola, and ten minutes vertically upwards by bus brings you to Chora, the capital, in a wonderfully panoramic position. 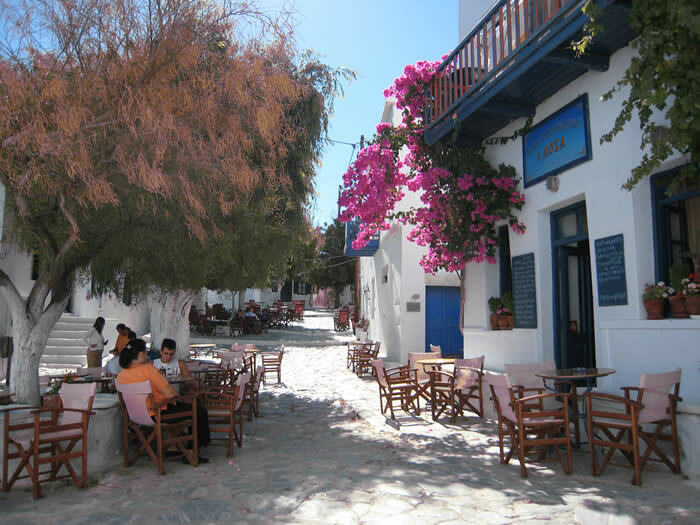 The village is enchanting, with everything painted white except the inhabitants. 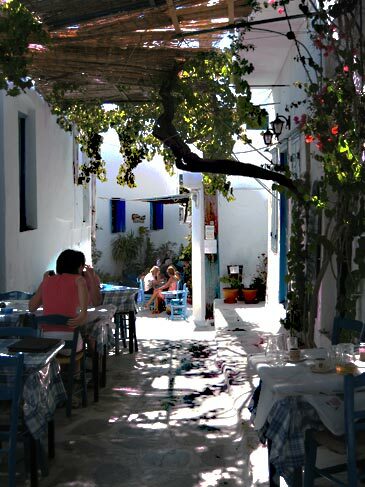 It has a magical stillness as traffic is almost unable to squeeze through the narrow alleyways – and any that can would have to clear away the tables and chairs of a dozen tavernas to generate the required space. 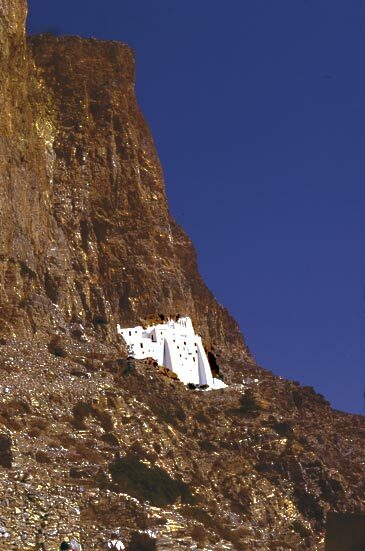 The famous hanging monastery is an easy walk down a perpendicular cliff: a few monks still inhabit this amazing edifice and will welcome you inside enthusiastically. You can return by bus. At the bottom of the same cliff-face is Agia Anna beach, but “bathing place” might be more apposite. 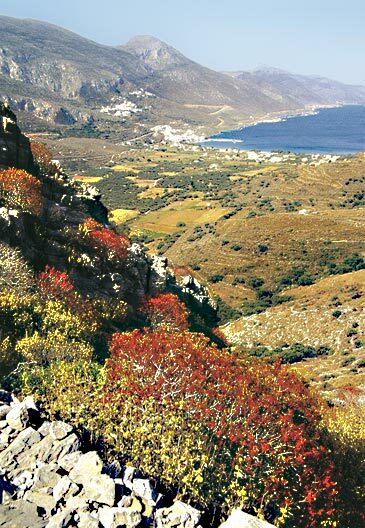 The walk along the spine of the island from here to Aegiali is challenging and magically scenic with seascapes to left and right nearly all the way – one of the great Cycladic walks. 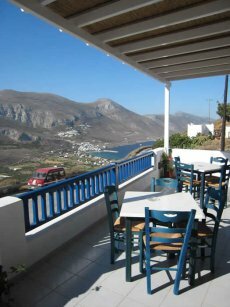 Lovingly refurbished in recent years, it is quite simple but combines atmosphere with convenience. There’s a café/bar at street level (very occasional noise) and a shady breakfast terrace. All rooms have sea view, with a panorama across to Tholaria. A stunning panorama of the bay below, whilst a few steps away is the almost mediaeval village. An airy reception area leads to a huge dining terrace. The rooms have large balconies. The family will look after you splendidly. 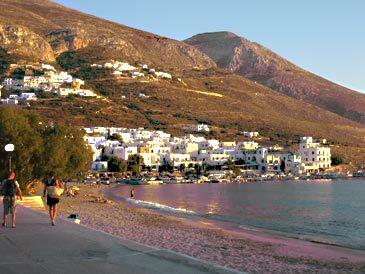 The beach and port, with a row of tavernas, is within walking distance, but the bus (or taxis) take only a few minutes. 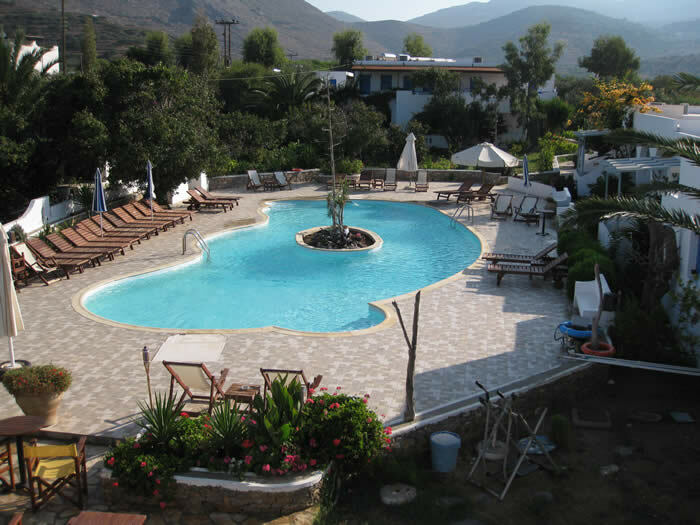 There is a double pool (adult and children) with pool bar and jacuzzi if you prefer to stay put. Cat B; air-con, TV, phone, hair-dryer, safe-box; free wi-fi; free transportation to and from Aegiali port by mini-bus; family vineyard; B&(buffet)B or HB. 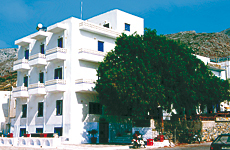 Opening straight on to the sandy beach and five minutes’ walk from the village centre, Lakki Village has studios and 1-bedroom apartments as well as rooms without kitchen, all recently refurbished. A large reception area where breakfast and meals may be bought overhangs the beach – and there’s now a sea-water pool. Pool, air-con, hair-dryer, TV, fridge, phone; RO or S/C 2-4 pers. 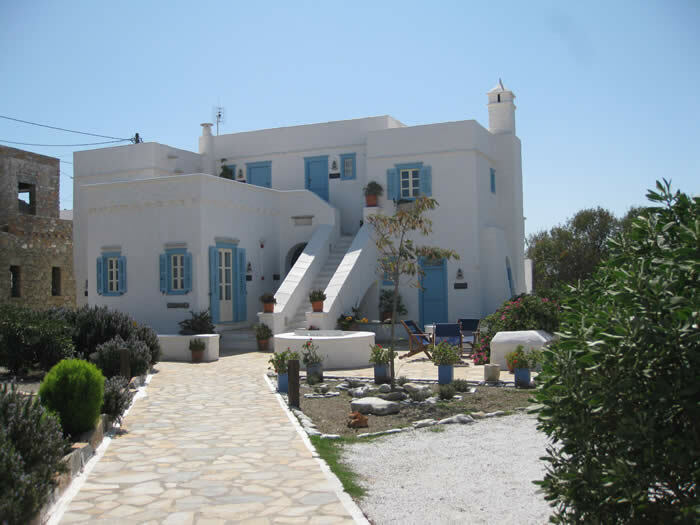 Dramatically situated just outside the entrance into the enchanting capital of the island and with a wonderful panorama north-west over the port of Katapola. Quiet, sunny and with lots of balconies and covered terraces. 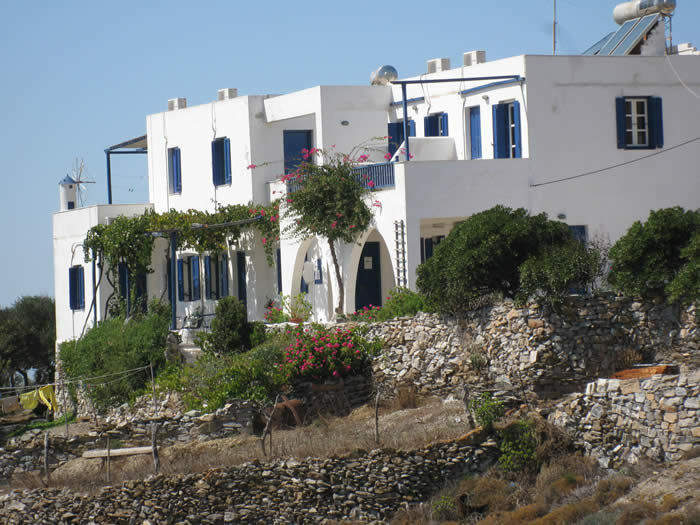 A new find – a charming, high quality boutique villa comprising a clutch of very comfortable studios with well equipped kitchenettes. Quiet situation at the top of the town, which all the rooms overlook – even the occasional glimpse of the sea and/or hills. 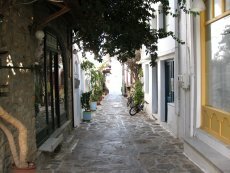 The really elegant and atmospheric place to stay in the Chora.